Two things I am absolutely obsessed with right now. MAC Plink! lipstick and Lush None of Your Beeswax Lipbalm. Plink! is a warm toned yellow pink with a shimmer, very glossy and soft. One of those colors that are beyond easy to slap on and go! Very glossy! Lush None of Your Beeswax is an oily ish lip balm. I love it though, usually i like something thicker but this is fab. It lasts on your lips for a long time and has a nice herbal lavender-y scent. It is VERY moisturizing. I wear it under lipsticks and use it as an overnight treatment. I just heard MAC is discontinuing Plink!.. WHY?! MAC, sometimes I really hate you. If you want plink! grab is now before its gone for good! No but Plink looks like a mix between pervette and angel so I'm going to have to get it! And i HATE when MAC discontinues products. One of my friends there is like ,"It is so if you have it it is really special." And I'm like no, it just causes un-needed stress! Plink was my very first MAC lipstick, and I love it. Such a shame they're discontinuing it - why the heck do they do that?! Always on the hunt for good lip balms too so might give that one a go. I haven't - I think it's a pink that would be waaaaay too light for me. I just wanted to let you know that once again you influenced my beauty purchases - I am investing in BRONZER - something I never usually buy but I bought a NARS one on Friday. I got Irresistiblement. I also got my highlights done too. I think I am now officially ready for Summer. It's unfortunate that summers here in SF involve LOTS of fog! Well at least I look like I just came back from a sunny vacation! 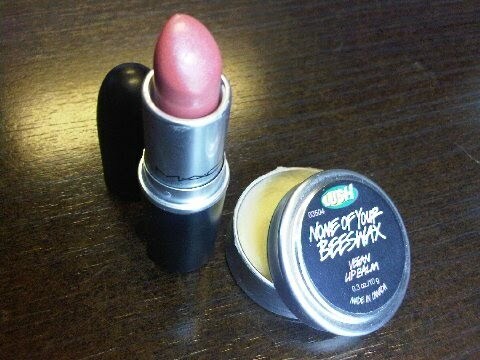 I have Lush Honey Trap and MAC Pink Nouveau and love to pair them too! Perhaps when they discontinue Plink! you could try those two together? i think i heard plink is just being discontinued in the u.s. so if you still travel to england you should be able to pick it up there! I hate when MAC decides to discontinue items and then list them under 'GoodByes' on their site, but don't lower the prices! What's up with that??? hahaha But I WILL be picking up Plink! this weekend...Oh yeah..I love that green tea you recommended...deeelish! I saw Plink! on Bloomingdales' and Nordstrom's websites and you can still get it while you can. Also, I too am in need of another one since I love it! Have you tried Lush's Honey Trap lip balm? It is my fave, the smell is just like the Mange Too massage bar (which I love). I have been checking my MAC counter every week for Plink and they never have it- now I know why, grrr..